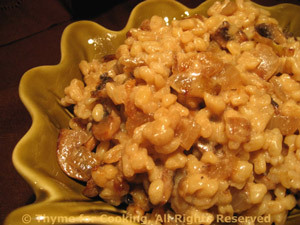 Barley with Mushroom Cream, Thyme for Cooking gourmet side dish for fall. Sautéed mushrooms and onions give a woodsy note to the barley. The Greek Yogurt gives it a creamy finish. I use quick-cooking barley, which takes about 15 minutes, and cooked it in beef stock for a more robust flavor. Heat oil in a medium skillet. Add onions and sauté until tender, about 7 minutes. Add mushrooms and sauté until lightly browned, about 5 minutes longer. Dissolve cornstarch in beef stock and add to skillet, stirring until bubbling and thick. Keep warm until barley is done. When barley is done, stir into mushroom sauce. Serve.